The primary role of the GMPQA professional is to assure that medicinal products are designed and developed in a way that meets the requirements of Good Manufacturing Practice (GMP). This involves the interpretation of GMP and an integration of their requirements into the quality systems being operated within a company. Review and release of batches of investigational products to ensure that they have been manufactured, packaged and testing in accordance with GMP and are suitable for use in clinical trials. The role also involves proactive input into changes in policies and working practices within the departments. As a QA professional, you will be contributing to the development of processes and policies within the department with a view to improving the quality of the work. A GMP QA professional typically works with many parts of the organisation. It really is a cross departmental role. Additionally your organisation may be involved in contracting out work or in collaborations with other organisations. You may be involved in auditing quality systems within these external organisations, establishing quality agreements with them and routinely monitoring the quality of the work they are performing on behalf of your own company. You may be expected to deliver training in the principles of GMP to new staff within your organisation as well as training for staff taking on particular GMP roles. It is also expected that all staff working in GMP areas receive periodic refresher training so you may be involved in putting together materials for this as well as running training workshops. All of this training needs to be organised and documented so organisation skills are also key. A career as a GMP QA professional will mean that you will be constantly developing your knowledge and skills. In order to audit quality systems, review and approve GMP related documentation and release batches of investigational products, you will need a good understanding of the science behind the work being conducted. Therefore as scientific techniques evolve and develop, you will be aware of this and learn about these exciting developments. You will also get opportunities to gain a broad understanding of the pharmaceutical industry, pharmaceutical quality systems and the drug development process in order to understand how your role fits in. You will also get the opportunity to attend professional development courses such as auditing skills, problem investigation and identification of corrective and preventative actions, risk management and process mapping, and you may get the opportunity to study for a MSc in Quality Management. The Qualified Person is a specific and important role within GMP and the Qualified Person has responsibility for the release/certification of investigational products for use in clinical trials. You may have the opportunity to undergo the training and development required to obtain eligibility as a Qualified Person. Many organisations that are involved in GMP work are large global companies that have sites on many locations. You may be required to travel to other locations in order to participate in joint improvement projects or perform audits on other sites within the company. The organisation you are working for may decide to contract some work to other organisations. You may be required to audit these 3rd party organisations, which could be located anywhere in the UK or abroad. The purpose of these audits will be to assess the standards that they are working to and whether this is acceptable to your organisation. You could be involved in supporting a number of pharmaceutical development projects, performing the review and release of materials used in the manufacture and packaging of investigational products and the review and release of the investigational products themselves. Leading and guiding the investigation of issues and problems in order to identify corrective and preventative actions will mean you are actively employing your problem solving skills. You are likely to be involved in the qualification/validation of systems and processes and associated change control activities. You may be performing audits on all parts of the quality system being operated. Additionally as you hold a unique role within the organisation that encompasses many departments, you will probably also get involved in improvement projects both in QA and across the scientific functions. You may be involved in supporting or hosting inspections of your organisation from regulatory authority inspectors. This will include helping to prepare for the inspection as well as answering questions and supporting scientific staff throughout the inspection. Working in QA means that you will never be stuck in an office all day not being able to meet people in other parts of your organisation. Your role means that you will be liasing with people from all parts of your organisation at all levels. You will be a key member of project teams working on the formulation and development of new products and also have routine interactions with people working in laboratories and manufacturing areas. 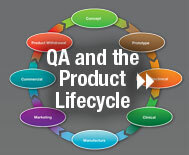 Working in QA is an excellent way to get to know all parts of the organisation and raise your profile.